Staples' Nico Ortega swims in winning the 400 freestyle in a meet against New Canaan on Wednesday. All those 5:30 a.m. practices and endless hours in the pool may about to pay off for Staples junior Nico Ortega. Already one of the top swimmers in the program’s recent history, Ortega is ready to chase a gold medal that has so far eluded him through two-plus seasons. He arrived on the local stage with a runner-up finish in the 500 freestyle behind Ridgefield star Kieran Smith. He’ll have a chance to do one better not only at FCIACs Thursday, but at the Class LL and State Open later in March. A violin and viola player, Ortega missed the Class LL meet a year ago due to an unfortunately-timed concert. Ortega spends each Saturday attending the Mannes School of Music in New York perfecting the instruments he’s played for even longer than he’s been in the pool. The season will culminate with the State Open on Saturday, March 18 at Yale’s historic Kiphuth Pool. Smith will not be swimming at FCIACs, opening a window for Ortega to claim gold. Ortega and older brother Sebastian — who also swam with the Wreckers — grew up in Caracas, Venezuela before moving at age 10, though he was shielded from the worst of one of the most dangerous cities on the planet. He immediately found a home in Westport in the pool with the Water Rats and Staples coach Frisk Driscoll. The pair spent significant time together prior to Ortega arriving at Staples High School honing his craft. Most swimmers each have their own unique story for trying the sport at a young age, and Ortega is no different. It came as a suggestion to the headmaster of his school in Venezuela, who believed it would be a good fit with his other form of art. Ortega is one of the major reasons why Staples has risen near the top of the FCIAC ladder in a bit of a renaissance season. 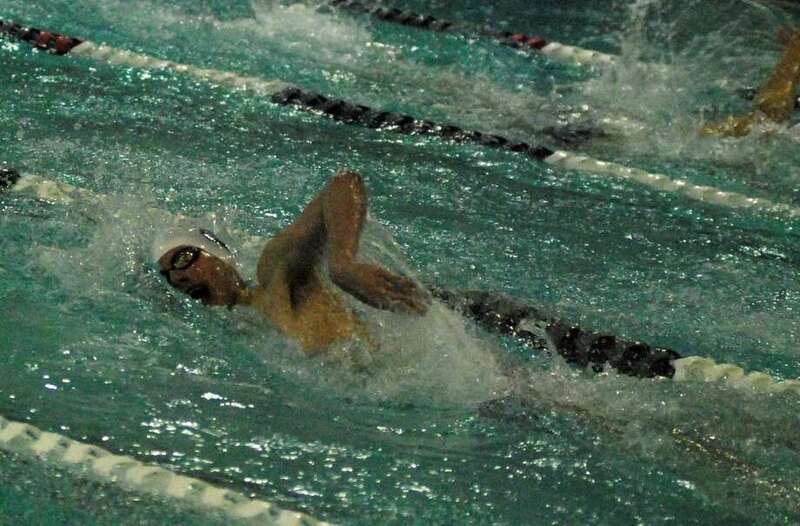 The Wreckers went 8-2 this winter and outswam New Canaan in a close defeat Feb. 8. A consistent double winner who assists on multiple relay teams, Ortega is responsible for at least 20 points in every dual meet. Ortega has also represented the Water Rats at several high-profile events over the past several years. He appeared in his first national competition at YMCA Short Course Nationals last April in Greensboro, North Carolina, and swam at the Speedo Music City Invitational last December in Nashville. At that event, Ortega broke a 17-year old Water Rat record by clocking in at 15:37.18 during the 1,650 freestyle. The natural comparison to previous distance standouts Daniel Williams and Jonathan Blansfield — now at Bowdoin and Northwestern respectively — is something Ortega enjoys. Blansfield holds the 400 freestyle record that may fall sometime next season. His lone Achilles’ heel makes his times even more impressive. Ortega and Driscoll have collaborated in drills to try to develop a stronger kick for the talented athlete, who is still unfinished in his development. If he manages to solve that Rubik’s Cube, look out. Ortega remains on the trajectory to join his fellow distance swimmers who attend high-academic, competitive swimming programs.